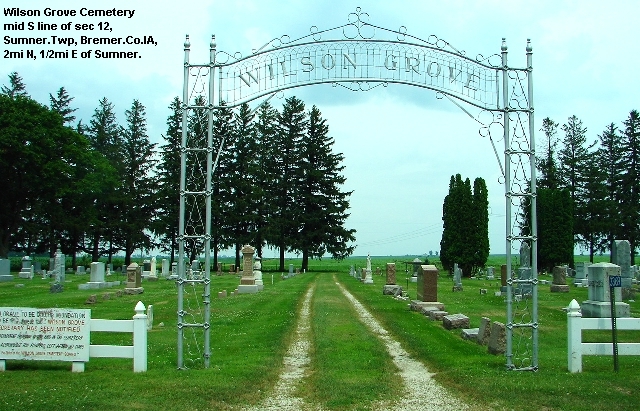 Burial: Wilson Grove Cem, Sumner.Twp, Bremer.Co.IA. Note 9: Farmed in Germany. Note 12: Bet. 1870 - 1873 Worked various jobs in Will.Co.IL. 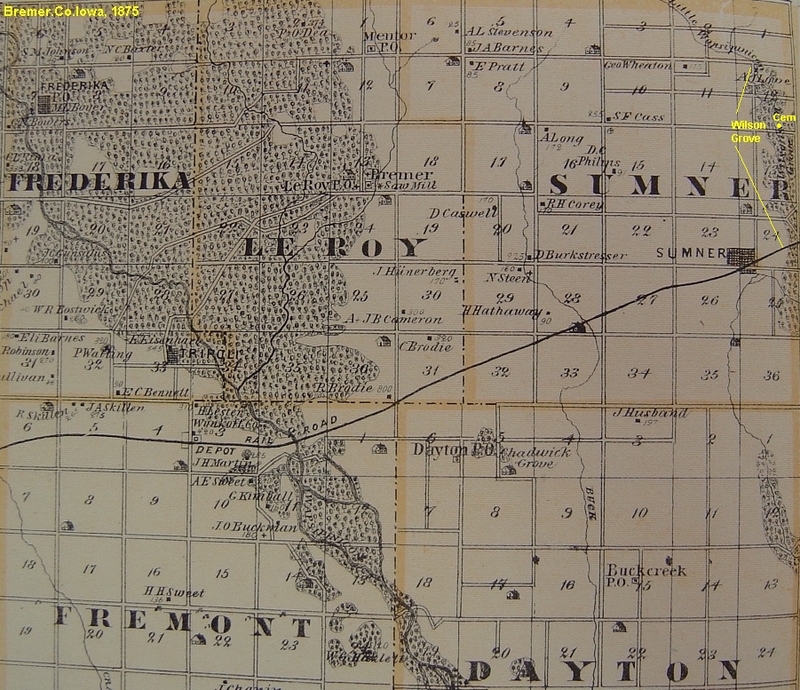 Note 14: 1873 IL to Center.Twp, Fay.Co.IA with son Fred. Note 6: 22 Mar 1876 Naturalized citizen. Note 14: Abt. 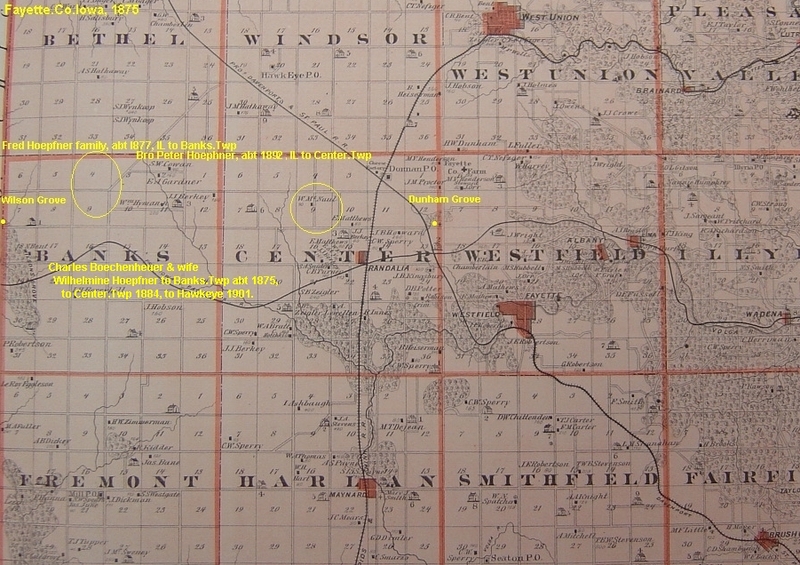 1892 IL to farm, sec 9, Randalia area, Center.Twp, Fay.Co.IA. 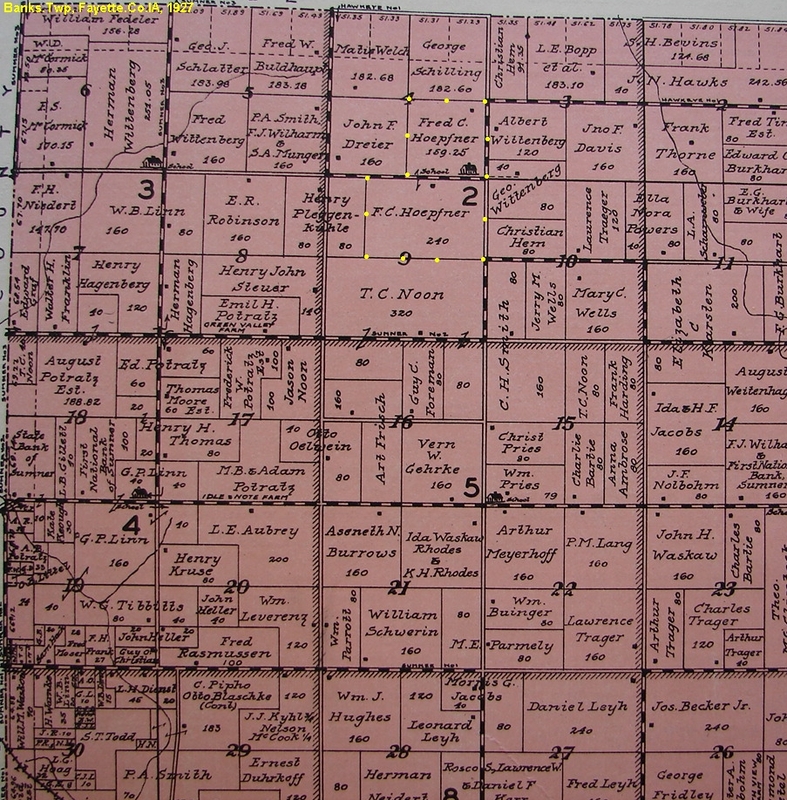 Note 16: 1900 Census; farming, Randalia area, Center.Twp, Fay.Co.IA; wife & 8ch. Note 22: 1930 Census; with s/law Daniel Knight, Randalia, Center.Twp, Fay.Co.IA. Note 4: 24 Oct 1850 Joined the German Army. Note 5: Abt. 1869 Germany to Will.Co.IL with parents. Note 6: Abt. 1877 IL to 80a. sec 9, Bank.Twp, Fay.Co.IA. 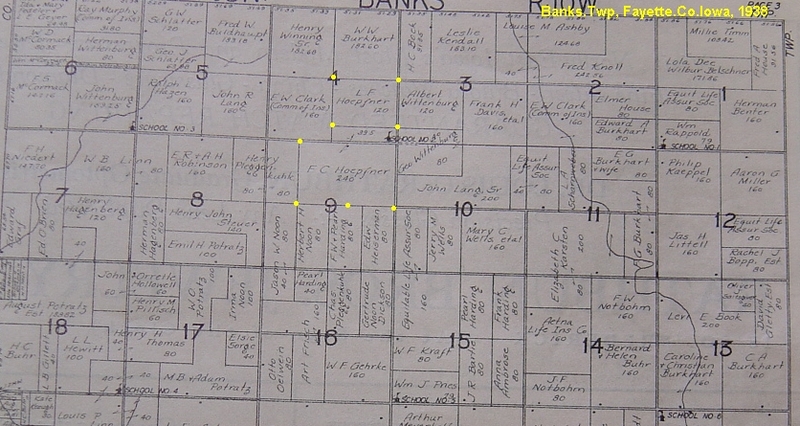 Note 19: 1890 Farming 289a in sec 9 & 4, Banks.Twp, Fay.Co.IA. Burial: Hawkeye Cem, lot 28, Windsor.Twp, Fay.Co.IA. 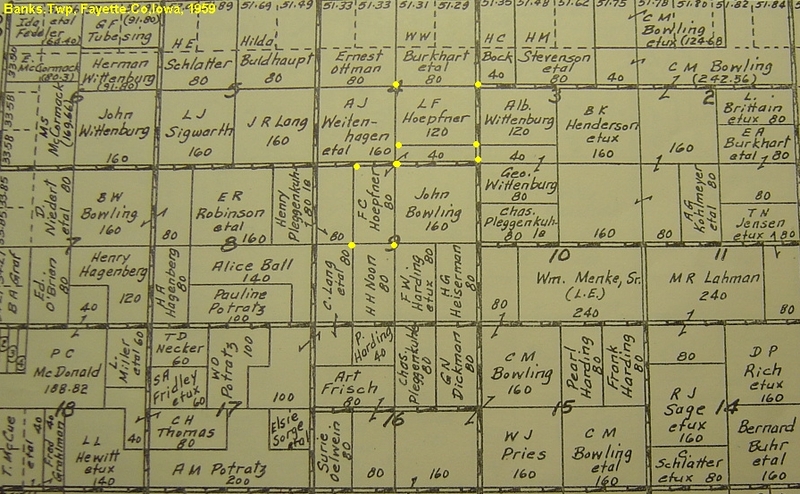 Note 11: 1890 Married, living in Center.Twp, Fay.Co.IA. Note 8: Abt. 1875 IL to 80a, E1/2 of NW1/4, sec 9, Banks.Twp, Fay.Co.IA. Note 11: 1884 Moved to farm in Center.Twp, Fay.Co.IA. Note 14: 1901 Retired into Hawkeye, Windsor.Twp, Fay.Co.IA. Note 27: Bet. 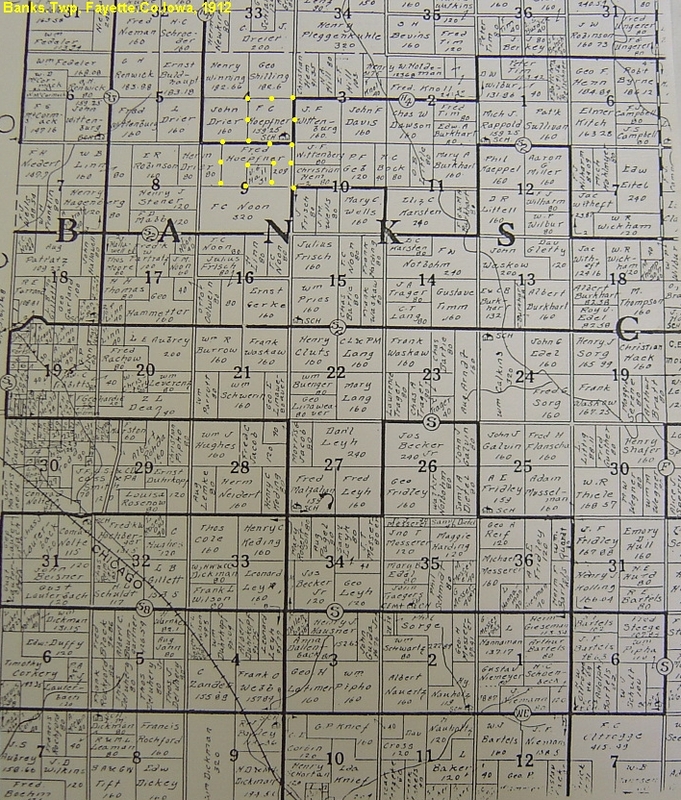 1901 - 1935 Had 75a farm, adj to W side of Hawkeye; sold after wife died. Hoepfner Jean E Unknown Hoepfner Howard H 1916/Center.Twp-1991/Owlwein.IA 1918 No date Woodlawn Oelwein Ch; Ruth Ann. Hoepfner Howard H Hoephner Unknown Jean E 1918/IA-?-? 3 Mar 1916 4 Aug 1991 Woodlawn Oelwein Son of Herman H. Hoephner 1889/IL-1964/IA & Sarah A. Odekirk 1884/Center.Twp-1967/IA. Ch; Ruth Ann. Hoephner Sarah A Odekirk Hoephner Herman H 1889/IL-1964/IA 6 Apr 1884 29 may 1967 Dunham Grove Center Twp Lot 132. Dau of Edward V. Odekirk 1856/WI-1924/Fay.Co.IA & Estella M. Proctor 1862/Westfield.Twp-1952/Chicago. Ch; Duane E, Howard H.
Hoephner Herman H. Hoephner Odekirk Sarah A 1884/Center.Twp-1967/IA 10 Aug 1889 14 Feb 1964 Dunham Grove Center Twp Lot 132. Son of Peter Hoephner 1852/Germ-1933/Center.Twp & Louisa Schultz 1856/Germany-1918/Center.Twp. Ch; Duane E, Howard H.
Hoephner Ellen M Anderson Hoephner Louis John 1877/IL-1959/IA 1891 1969 Dunham Grove Center Twp Lot 173. Dau of Gusta A. Anderson b. Sweden & Emma Sperling 1859/IL. Ch; Dorothy, Violet A, Hazel H, Pauline. Hoephner Hazel Hoephner Hoephner dau of Louis John 1915 No date Dunham Grove Center Twp Lot 173. Dau of Louis John Hoephner 1877/IL-1959/IA & Ellen M. Anderson 1891/Sweden-1969/IA. Hoephner Louis John Hoephner Anderson Ellen M 1891/Sweden-1969/IA Dec 25, 1877 1959 Dunham Grove Center Twp Lot 173. Son of Peter Hoephner 1852/Germ-1933/Center.Twp & Louisa Schultz 1856/Germany-1918/Center.Twp Ch; Dorothy, Violet A, Hazel H, Pauline. Hoephner Louisa Schulty Hoephner Peter May 19, 1856 28 Jul 1918 Dunham Grove Center Twp Lot 87. (Suspect) Dau of Hermann Schultz & Chirstina Saase. Ch; Wilhelmine Louise, Lewis, Augusta, Ella Emma, Nellie, Mary, Herman H, Eliz F, Fred C, Lula, Peter N.
Hoephner Fred C Hoephner Son of Peter Hoephner 10 Feb 1884 20 Jan 1941 Dunham Grove Center Twp Lot 87. CO B 20th Engr. Son of Peter Hoephner 1852/Germ-1933/Center.Twp & Louisa Schultz 1856/Germ-1918/Center.Twp. Hoephner Peter Hoephner Schuldt Louisa 1856/Germ-1918/Center.Twp 6 Oct 1852 8 Mar 1933 Dunham Grove Center Twp Lot 87. Son of Jonas Hoepfner 1805/Germ-1878/Banks.Twp & Maria Timm 1817/Gem-1895/Sumner.IA. Ch; Wilhelmine Louise, Lewis, Augusta, Ella Emma, Nellie, Mary, Herman H, Eliz F, Fred C, Lula, Peter N.
Hoephner Peter N Hoeffner Warner Agnes Wilbur 1896/?-1980/? Feb 25, 1901 Dec 25, 1963 West Union West Union Buried under Hoeffner inscription however Hoephner is surname used by his line in Center.Twp; bz/2010. Son of Peter Hoephner 1852/Germ-1933/Center.Twp & Louisa Schullz 1856/Germany-1918/Center.Twp. 1 HOEPFNER, Jonas Friederick Heinrich Hoephner b: 13 Nov 1805 in Bernitt, Mecklenburg, Germany d: 18 Jun 1878 in Sec 4, son Fred's farm, Banks.Twp, Fay.Co.IA Burial: Wilson Grove Cem, Sumner.Twp, Bremer.Co.IA. 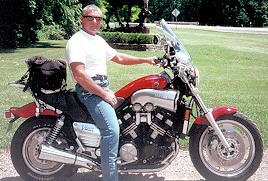 Note 1: 04 Jan 2011 Hoepfner last reviewed; Barry Zbornik Hannibal Missouri iowaz@hotmail.com Note 3: Surname analogs; Hoepfner, Hoephner, Hoepffner, Hoeffner. Note 9: Farmed in Germany. Note 11: Abt. 1869 Germany to Will.Co.IL Note 12: Bet. 1870 - 1873 Worked various jobs in Will.Co.IL. Note 14: 1873 IL to Center.Twp, Fay.Co.IA with son Fred. .. +TIMM, Mary Maria Marla Catharina Dorothea b: 25 Nov 1817 in Bernitt, Mecklenburg, Germany d: 10 Oct 1895 in Sumner, Bremer.Co.IA Burial: Wilson Grove Cem, Sumner.Twp, Bremer.Co.IA. m: 01 Feb 1839 in Bernitt, Mecklenburg, Germay Father: Johann Joachim Christian TIMM Mother: Catherina Maria Elizabeth OFEN Note 9: 1880 Census; with s/law Charles Boekenheuer, sec 9, Banks.Twp, Fay.Co.IA. 2 HOEPHNER, Peter Joachim Wilhelm Johann Hoepfner b: 06 Oct 1852 in Old Bernitt, Mecklenburg, Germany d: 08 Mar 1933 in Center.Twp, Fay.Co.IA Burial: Dunham Grove Cem, lot 87, Center.Twp, Fay.Co.IA Note 5: Bet. 1870 - 1978 Germany to Naperville area, Will.Co.IL Note 6: 22 Mar 1876 Naturalized citizen. Note 7: Bet. 1879 - 1892 Farming, Pilot.Twp, Kankakee.Co.IL Note 14: Abt. 1892 IL to farm, sec 9, Randalia area, Center.Twp, Fay.Co.IA. 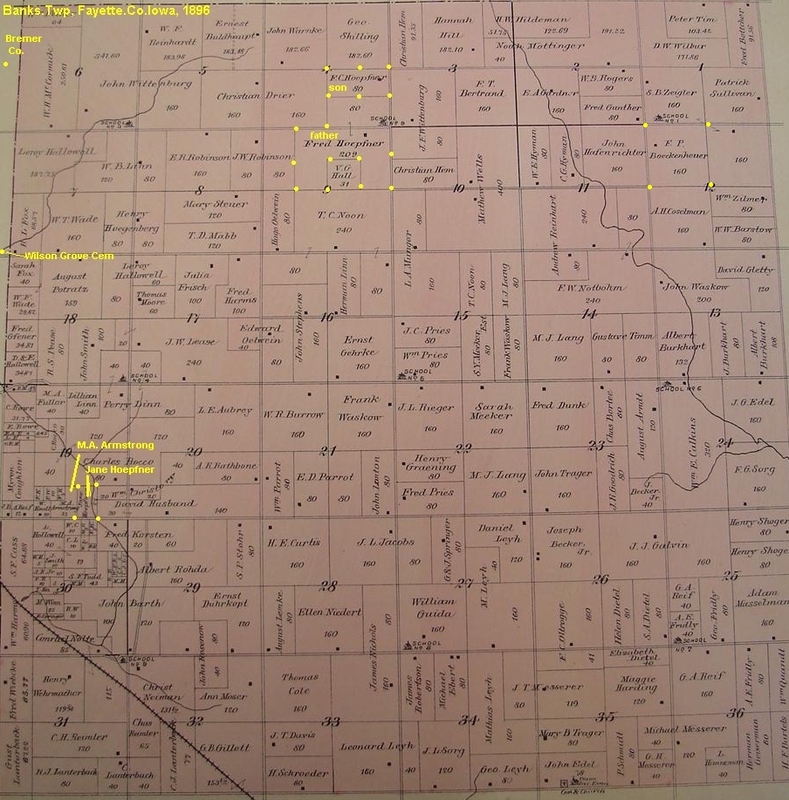 Note 16: 1900 Census; farming, Randalia area, Center.Twp, Fay.Co.IA; wife & 8ch. 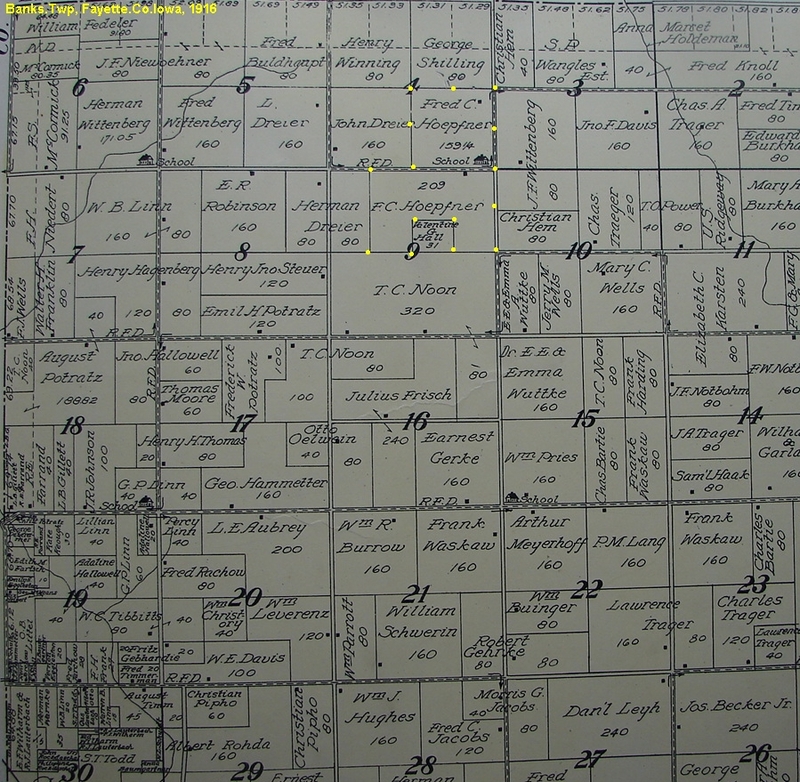 Note 18: 1910 Census; Hoeffner51Germ, farming, Randalia area, Center.Twp, Fay.Co.IA. Note 22: 1930 Census; with s/law Daniel Knight, Randalia, Center.Twp, Fay.Co.IA. ... +SCHULTZ, Louisa Luise Johanna Dorothea b: 19 May 1856 in Buschmuehlen, Mecklenburg, Germany d: 28 Jul 1918 in Sec 9, Center.Twp, Fay.Co.IA Burial: Dunham Grove, lot 87, Center.Twp, Fay.Co.IA m: 04 Sep 1875 in Zion Luth. Ch, Wheatland.Twp, Will.Co.IL Father: Unknown SCHULTZ Note 5: 1868 Germany to Naperville area, Will.Co.IL, with parents. Note 8: 1910 Census; 11ch, 7 living. 3 HOEPHNER, Wilhelmine Louise b: 11 Dec 1875 in St. Matthew, Lemont.Co.IL? 3 HOEPHNER, Louis John Lewis b: 25 Dec 1877 in Will or Kankakee.Co.IL d: 1959 in Benton.Co.IA? Burial: Dunham Grove Cem, lot 173, Center.Twp, Fay.Co.IA Note 6: 1915 Census; farming, Randalia area, Center.Twp, Fay.Co.IA. Note 8: 1925 Census; farming, $7k/2k, Newhall area, Benton.Co.IA. Note 9: 1925 Adj Henry Schultz 68 & wf Minnie F 67, possibly uncle, bz/2011. 3 HOEPHNER, Augusta Gussta b: Jan 1880 in Herscher, Kankakee.Co.IL d: 1935 Note 8: 1900 Census; 19y, servant, Joshia Moore39WI farmily, Windsor.Twp, Fay.Co.IA. 3 HOEPHNER, Mary b: Mar 1886 in Herscher, Kankakee.Co.IL d: 1970 in CA? 3 HOEPHNER, Herman H. b: 10 Aug 1889 in Herscher, Kankakee.Co.IL d: 14 Feb 1964 in Iowa? Burial: Dunham Grove Cem, lot 132, Center.Twp, Fay.Co.IA Note 8: 1920 Census; renting farm, Randalia area, Center.Twp, Fay.Co.IA. 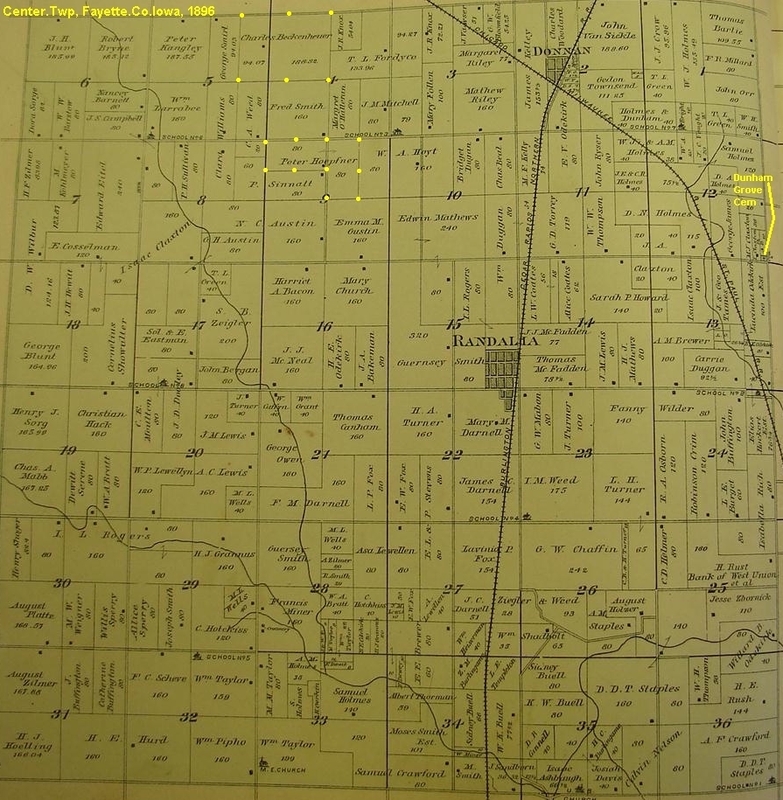 Note 11: 1930 Census; farming, Randalia area, Center.Twp, Fay.Co.IA; wife & 2ch. 3 HOEPHNER, Elizabeth Lizzie Elsie F. b: Oct 1891 in Herscher, Kankakee.Co.IL Note 3: Called Lizzie. .... +KNIGHT, Daniel Jonathan b: 19 Nov 1890 in Brush Creek (Arlington), Fayette, Iowa d: 29 Jan 1941 in Fay.Co.IA? Burial: Grandview Cem, burial 1957, sec E, lot 162, Fayette, Iowa. m: Abt. 1921 in Randalia, Center.Twp, Fay.Co.IA Father: Arthur KNIGHT Mother: Katherine Vincent SMITH Note 3: Lived near Randalia. Note 8: Cause of death; chronic dementia (are various causes). Note 19: 1925 Census; single, father with, blacksmith shop, Randalia, Center.Twp, Fay.Co.IA. Note 22: 1930 Census; blacksmith shop, Randalia, Center.Twp, Fay.Co.Ia. Note 23: 1930 Census; 3 teachers boarding with.
. 4 KNIGHT, Inez Nell b: 26 Jan 1922 in Randalia area, Center.Twp, Fay.Co.IA d: 26 Jan 1922 in Randalia area, Center.Twp, Fay.Co.IA Burial: Grandview Cem, burial 1347, sec E, lot 162, Fayette, Iowa.
. 4 KNIGHT, Daniel Jay b: 01 Jun 1926 in Randalia, Fayette, Iowa d: 25 May 1933 in Oelwein, Fayette, Iowa Burial: Grandview Cem, burial 1651, sec E, lot 162, Fayette, Iowa. Note 6: Cause of death; peritonitis (appendicitis). 3 HOEFFNER, Peter N. Hoephner b: 25 Feb 1901 in Sec 9, Center.Twp, Fay.Co.IA d: 25 Dec 1963 in Fay.Co.IA Burial: West Union Cem, Fay.Co.IA. 2 HOEPFNER, Frederick Fred John Hoephner b: 24 Oct 1839 in Old Bernitt, Mecklenburg, Germany d: 05 Dec 1912 in Sec 4, Bank.Twp, Fay.Co.IA Burial: Wilson Grove Cem, Sumner.Twp, Bremer.Co.IA Note 4: 24 Oct 1850 Joined the German Army. Note 5: Abt. 1869 Germany to Will.Co.IL with parents. Note 6: Abt. 1877 IL to 80a. sec 9, Bank.Twp, Fay.Co.IA. 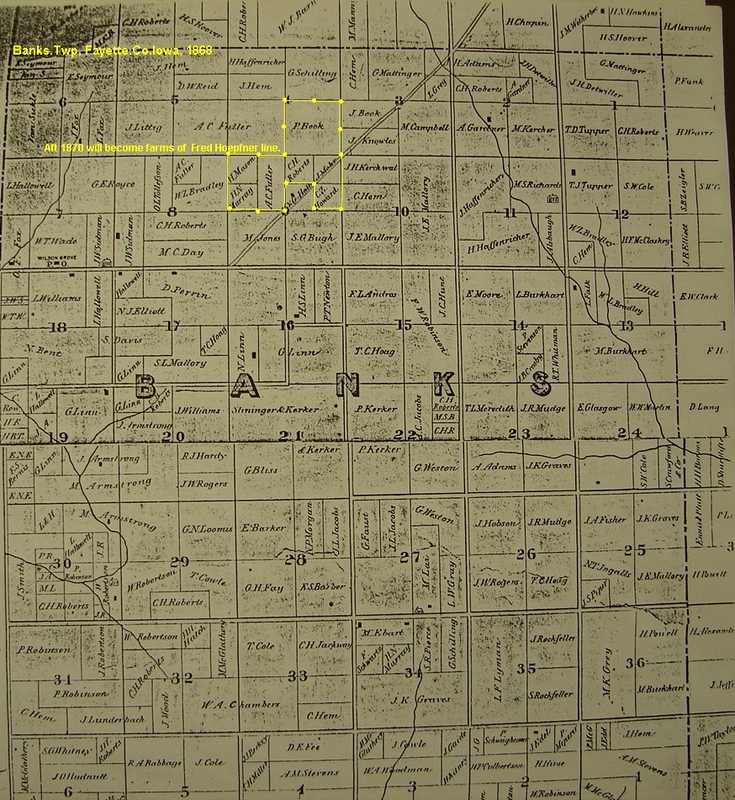 Note 7: 1878 Hist; farming sec 9 & 4, Banks.Twp, Fay.Co.IA, Sumner P.O. Note 8: 1880 Census; farming, Banks.Twp, Fay.Co.IA; wife & 4 ch. Note 9: 1880 Enumerated as Hoepfner (only fam in Fay.Co.IA). Note 16: 1889 Erected 100x51' barn on sec 9 farm, Bank.Twp, Fay.Co.IA. Note 19: 1890 Farming 289a in sec 9 & 4, Banks.Twp, Fay.Co.IA. ... +QUANDT, Mary Mariah b: 13 Jul 1841 in Mecklenburg, Germany d: 29 Mar 1910 in Sec 4, Bank.Twp, Fay.Co.IA Burial: Wilson Grove Cem, Sumner.Twp, Bremer.Co.IA. m: 28 Apr 1865 in Mickelnburg, Germany Father: Joseph QUANDT Mother: Caroline UNKNOWN Note 8: 1869 Germany to Michicgan with parents. 3 HOEPFNER, Fred C. Hoephner b: 1866 in Mecklenburg, Germany d: 1937 in Fay.Co.IA Burial: Wilson Grove Cem, Sumner.Twp, Bremer.Co.IA. Note 5: 1869 Germany to U.S. Note 11: 1920 Census; farming, Wilson Grove area, Banks.Twp, Fay.Co.IA; wife & 6 ch.
. 4 HOEPFNER, Leonard Leo F. b: 1897 in Sec 9, Banks.Twp, Fay.Co.IA d: 04 Nov 1982 in Iowa Burial: Wilson Grove Cem, Sumner.Twp, Bremer.Co.IA. Note 8: 1920 Census; farming, adj to father, married, Banks.Twp, Fay.Co.IA. ..... +UNKNOWN, Alice M. b: 1902 in Fay.Co.IA d: 1956 in Iowa Burial: Wilson Grove Cem, Sumner.Twp, Bremer.Co.IA. ... 5 HOEPFNER, Carl Jean b: 1935 in Iowa d: 1952 in Iowa Burial: Wilson Grove Cem, Sumner.Twp, Bremer.Co.IA.
. 4 HOEPFNER, Edna L. Hoephner b: 11 Dec 1908 in Sec 9, Bank.Twp, Fay.Co.IA d: 23 Apr 1910 in Sec 9, Bank.Twp, Fay.Co.IA Burial: Wilson Grove Cem, Sumner.Twp, Bremer.Co.IA. 2 HOEPFNER, Wilhelmine b: 27 Jul 1846 in Ulrichenhof, Mecklenburg, Germany d: 09 Apr 1935 in Hawkeye, Windsor.Twp, Fay.Co.IA Burial: Hawkeye Cem, lot 28, Windsor.Twp, Fay.Co.IA. Note 11: 1890 Married, living in Center.Twp, Fay.Co.IA. ... +BOECKENHEUER, Charles Boechenhauer b: 01 Nov 1847 in Mecklenburg, Germany d: 15 Mar 1932 in Hawkeye, Windsor.Twp, Fay.Co.IA Burial: Hawkeye Cem, lot 28, Windsor.Twp, Fay.Co.IA. m: 16 Aug 1870 in Naperville, Cook.Co.IL Father: Unknown Boechenhauer BOECKENHEUER Note 3: Surname analogs; Boekenheuer, Boekenhauer, Beckenhauer. Note 8: Abt. 1875 IL to 80a, E1/2 of NW1/4, sec 9, Banks.Twp, Fay.Co.IA. Note 9: 1880 Census; farming, sec 9, Banks.Twp, Fay.Co.IA. Note 10: 1880 Charles32Germ, Willeminia33Germ, Fred9IL, Rosie6IL, Martin4IA, Herman2IA, m/lawMary Hoepfner63Germ. Note 11: 1884 Moved to farm in Center.Twp, Fay.Co.IA. 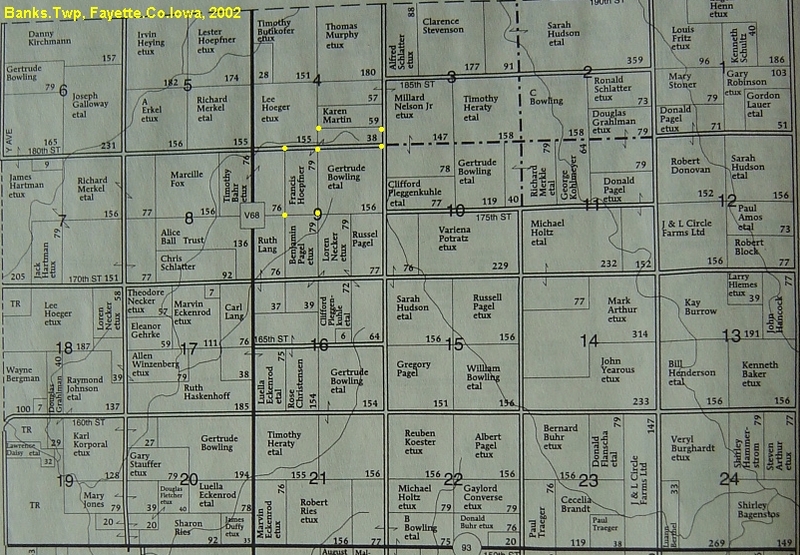 Note 13: 1896 Plat; 94a E1/2ofNE1/4 sec 5 & 188a NW1/4 sec 4, Center.Twp, Fay.Co.IA Note 14: 1901 Obit; retired into Hawkeye, Windsor.Twp, Fay.Co.IA. Note 16: 1910 Census; retired in Hawkeye, Windsor.Twp, Fay.Co.IA. Note 17: 1880 Charles62Germ, Whilhelmine63Germ, sonHerman32IA, dauMary25IA. Note 25: 1930 Census; retired in Hawkeye, Windsor.Twp, Fay.Co.IA. Note 26: 1930 Charles82Germ, Wilhelmna83Germ, son Herman52IA, dau Mary45IA. Note 27: Bet. 1901 - 1935 Had 75a farm, adj to W side of Hawkeye; sold after wife died. Note 28: Cuase of death; after seveal days of flu. 3 BOECKENHEUER, Frederick P. b: 22 Feb 1871 in Naperville area, Cook.Co.IL d: 02 Feb 1954 in Hawkeye area, Windsor.Twp, Fay.Co.IA Burial: Hawkeye Cem, lot 382, Windsor.Twp, Fay.Co.IA Note 9: 1896 Plat; 160a, NW1/4, Banks.Twp, Fay.Co.IA. Note 12: 1910 Census; farming, Randalia area, Center.Twp, Fay.Co.IA; wife & 2ch. .... +UNKNOWN, Anna Louise b: 17 Dec 1873 in Fay.Co.IA d: 06 Oct 1923 in Hawkeye area, Windsor.Twp, Fay.Co.IA Burial: Hawkeye Cem, lot 382, Windsor.Twp, Fay.Co.IA m: 1895 in Banks or Center.Twp, Fay.Co.IA Note 4: Parents b. Meckenburg, Germany.
. 4 BOECKENHEUER, Ella b: Apr 1896 in Banks.Twp, Fay.Co.Ia Note 8: 1954 Living at Hawkeye, Windsor.Twp, Fay.Co.IA.
. 4 BOECKENHEUER, Carl F. b: 02 Oct 1906 in Center.Twp, Fay.Co.IA d: 18 Jun 1971 in Fay.Co.IA? Burial: Hawkeye Cem, lot 579, Windsor.Twp, Fay.Co.IA. Note 11: 1954 Living at Hawkeye, Windsor.Twp, Fay.Co.IA.
. 4 BOECKENHEUER, Jessie b: 19 Sep 1901 in Center.Twp, Fay.Co.IA d: 02 Jan 1965 in Hawkeye, Windsor.Twp, Fay.Co.IA Burial: Hawkeye Cem, lot 392, Windsor.Twp, Fay.Co.IA. Note 11: 1954 Living at Bellingham.WA. 3 BOECKENHEUER, Rose b: 1874 in Naperville area, Cook.Co.IL d: in Calif? Note 11: 1932 Living in Hawkeye area, Windsor.Twp, Fay.Co.IA. 3 BOECKENHEUER, Martin P. b: 1876 in Sec 9, Banks.Twp, Fay.Co.IA d: 30 Jul 1962 in Fay.Co.IA Burial: Hawkeye Cem, lot 537, Windsor.Twp, Fay.Co.IA Note 11: Bet. 1910 - 1920 Census; farming, Center.Twp, Fay.Co.IA. Note 19: 1932 Living in Fayette area, Fay.Co.IA. 3 BOECKENHEUER, Mary b: 1884 in Banks or Windsor.Twp, Fay.Co.IA d: 02 Jan 1975 in Good Samaritan Hm, Fay.Co.IA Burial: Hawkeye Cem, 28, Windsor.Twp, Fay.Co.IA. Note 11: Bet. 1910 - 1930 Census; with parents in Hawkeye, Windsor.Twp, Fay.Co.IA. Note 18: 1966 Living in West Union, Fay.Co.IA. Entire plats for all the available years are on the photo site.